Mary McNeight has been locally and nationally recognized by her peers for excellence in both pet and service dog training. The ultimate honor came when Mary McNeight, CPDT-KA, CCS, BGS presented on Service Dog Program Basics and Law at the Association of Professional Dog Trainers 2013 Conference. Mary McNeight was a featured author in the 6000+ dog trainer organization The Association Of Professional Dog Trainers magazine The Chronicle of the Dog Summer 2014 Issue. Her article titled Clearing Up The Confusion: Assistance Dogs and Their Public Access Rights was written to help dog trainers understand the access rights of service dogs in training (like diabetic alert dogs) in their training studios and classrooms. Service Dog Academy and Diabetic Alert Dog University was featured as a Small Medium Business Hero for the help we provide to people with disabilities and reduced income. 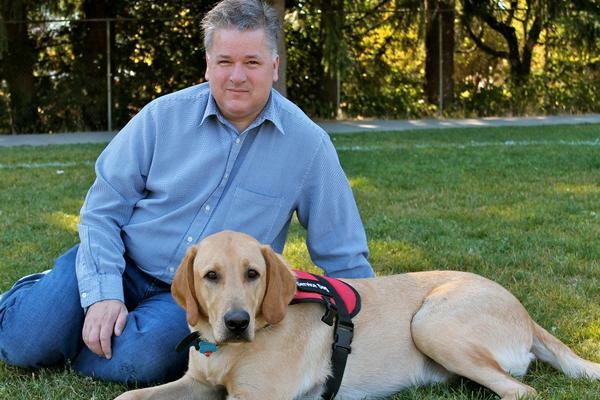 Additionally this article talks about how one of our students, Jeff Dempsey, a Boeing Engineer, used both our in home boarding and classroom services to train his own diabetic alert dog. “You Were Awesome” was the feedback we received from Emily Coles, Head Of Communities, at the Diabetes Hands Foundation for our interview on diabetic alert dog training. In this hour long interview we talk about how I got started training diabetic alert dogs, some basics of diabetic alert dog training, how to prevent yourself from getting scammed by a trainer and answer questions from the live community online with us during the interview. Apparently the interview was the most popular interview they had had since the inception of the interview series several years ago! Diabetes Hands Foundation and Tu Diabetes are diabetes support and advocacy groups. We recommend you check them out! Mary McNeight is a worldwide traveler. She’s lived in Pakistan, climbed into the pyramids in Egypt, walked around the Roman Colosseum and visited castles in Germany. Little did Alaska Airlines know when they interview Mary, that her service dogs have taken over 50 flights all across the US from one coast to another. In this article Jim Gullo references Service Dog Academy’s train your own diabetic alert dog program as one of only a handful of programs around the US that are creating life long bonds of love and support through service dog training. As many of you already know, Mary McNeight loves labradors for their temperaments for service work. In this article Just Labs Magazine Writer Shelley Bueche talks about our diabetic alert dog training program as well as how we used our diabetic alert dog training methodology and applied it to other disabilities like Migraines and Epilepsy. Additionally this article is the first press mention of how we helped to train the Worlds First Narcolepsy Alert Dog in 2010! The Association of Pet Dog Trainers has over 6000 members who dedicate themselves to the advancement of positive reinforcement dog training. The topic of this contest was to teach a dog proper greeting behavior, something our service dogs have to do on a daily basis. We thought we would share the technique we teach our service dog students with pet dogs so that they too could have a well behaved pet dog. The APDT thought it was such a great video demonstrating positive reinforcement dog training that they to award us a $1500 scholarship to the 2012 APDT educational seminar. We are so excited, honored and blessed that the APDT recognizes our hard work and want to thank Dr. Robert Curran and NewTrix for providing the scholarship. Labradors.com only works with a handful of highly trained dog trainers to produce its content. Service Dog Academy’s Mary McNeight was featured in numerous articles on pet dog training using service dog training techniques. Articles topics include How To Prevent Resource Guarding, Taking Treats Nicely, Reducing Energy Levels Through Work To Eat Puzzles and Working Through Fear The Service Dog Way. Service Dog Academy Featured on Q13 Fox News talking about Fireworks and the 4th of July! Having an anxiety condition herself, Mary thought it a good idea for people to be prepared to help their dogs during the 4th of July fireworks season. To hear what Mary suggests dog owners do during the 4th, click on the image above to be taken to the video. Liame to Be Honored by PAWS of Bainbridge Island and North Kitsap as “Hero Dog” for inspiring Service Dog Academy, West Seattle’s Premier Dog Training Facility. On May 19th Liame, Service Dog Academy’s first student, was officially honored as a “Community Hero” for inspiring the creation of Service Dog Academy and personally helping over 525 dogs in the Puget Sound region as well as thousands online through our free dog training advice youtube channel. PAWS of Bainbridge Island and North Kitsap will hold an elegant, red carpet presentation, Spotlight on Community Hero Pets, will honor recipients in six categories, including search and rescue, law enforcement, therapy, military, and service animals. To help PAWS of Bainbridge Island and North Kitsap continue its mission to help homeless animals donate here. On November 30th Service Dog Academy was featured on New Day Northwest with Margaret Larson where we talked about our Diabetic Alert Dog Classes. We were accompanied by 4 of our service dog students, 2 diabetic alert dogs, 1 narcolepsy alert dog and one hearing alert dog. 2 of the dogs were under 8 months of age and made us VERY proud with their calm demeanors. You can watch the interview by clicking on the photo above. We had one of our diabetic alert dog students go low right as the audience members were walking into the studio which consequently set off all three diabetic alert dogs. Proof positive that our training works! Citka, our first Improvisational Diabetic Alert Dog was recently featured in the Key Peninsula News. The story talks about how Citka has repeatedly saved Judith’s life using his highly training diabetic low sensing nose. Amazingly Citka has also started alerting to Judith’s atrial fibrillation. We are so proud of what Judith has accomplished through our Diabetic Alert Dog 101 training class. The Service Dog Academy was recently featured in the latest issue of Animal Wellness Magazine in an article about detection dogs! The article featured one of our past diabetic alert students, Buddy, who saved his owner’s life when his blood sugar crashed and he passed out at work. To Read the entire article please download the following pdf. We use a number of Premier’s dog training toys to help train our diabetic alert dogs. Premier was gracious enough to allow us to tell them in a guest blog post about how we use positive reinforcement and their amazing toys to create what we call the Improvisational Diabetic Alert Dog (TM). You can read more on the process of how we use Premier toys on Premiers Blog. In this interview City Stream reporter Roxeanne Vainuku talks with Mary McNeight and one of Service Dog Academy’s clients Jacqueline Glass about the training of her dog Peanut, a diabetic alert dog in training. The Association for Pet Dog Trainers, a nationally recognized group with over 5,000 members worldwide has awarded The Service Dog Academy in the National Train your Dog Month campaign with The Most Creative Community Event! We certainly made a scene in downtown Seattle’s Westlake Park when, to the tune of “Walking The Dog” by Rufus Thomas, 14 handlers and their positively trained dogs simultaneously demonstrated basic skills taught in most dog training classes. The first ever positively trained flash mob (that we know of) managed to win over the APDT and make the news! Ian Sterling, reporter for Komo Newsradio, became interested in The Service Dog Academy’s Diabetic Alert program and the groundbreaking training programs she offers at her dog training school. Sterling recently caught up with Mary and Liame at the West Seattle Dog Training Studio and Mary had the opportunity to share with the Seattle area her groundbreaking program in diabetic alert, utilizing a dog’s powerful scent receptors to help monitor blood sugar, and her innovative training with a dog to alert and assist with narcolepsy. In more great news, The Service Dog Academy was recently visited by Examiner reporter Prescott Breeden. He talked with Mary McNeight about the expanding world of service dogs, and diabetic alert training – which is now being offered at the studio! We are so excited to be featured in the Seattle Examiner, and to share our upcoming ventures and training opportunities with the community. Check out the recently published article here. Zuzu a service dog in training in our west seattle dog training classes. Image copyright Tracy Campion. Our unique train your own service dog program is making news again! In celebration of National Assistance Dog Week, Tracy Campion a writer for the Examiner decided to write several amazing stories on the uniqueness of our program. Tracy visited our West Seattle service dog training classes and spoke with some of our service dogs in training. Screen capture taken from KMPS website. The Service Dog Academy was recently featured on 94.1 KMPS’s Good In Your Neighborhood Radio Program. In this interview I talk about how the Service Dog Academy came about, who we help and what we plan to do in the future. The Service Dog Academy was recently featured on Fox’s National News Channel. Our head trainer was one of the dog teams shown during the program (see above image) and is the dog trainer Dan Springer is referring to at the end of the story. There was a longer piece that included our head trainer working with a diabetic detection service dog but was cut from the story due to election news. We are excited about this opportunity for media exposure so that we can start helping even more people! If you would like more information about our services please use the above categories to navigate our website and enter your questions into the corresponding pages. If you saw the interview and would like to make comments about it, we have provided a forum for you to do so on this page. West Seattle Blog Features Our Dog Training Studio numerous times! The Service Dog Academy is an avid reader of the West Seattle Blog and has had the great fortune of being mentioned on it on numerous occasions. One of their stories covered the announcement of our How To Train Your Own Diabetic Alert Dog Program and its recent graduates in November 2011. Additionally they graciously featured our Positively Trained Dog Flash Mob. That flashmob went on to win the The Association for Pet Dog Trainers, National Train your Dog Month campaign with The Most Creative Community Event! You can hear about the first half of our owner Mary McNeight’s story on King 5’s television program Evening Magazine by watching it though this web link or clicking on the image above.